Registration for the 2019 AG Forum is now closed. 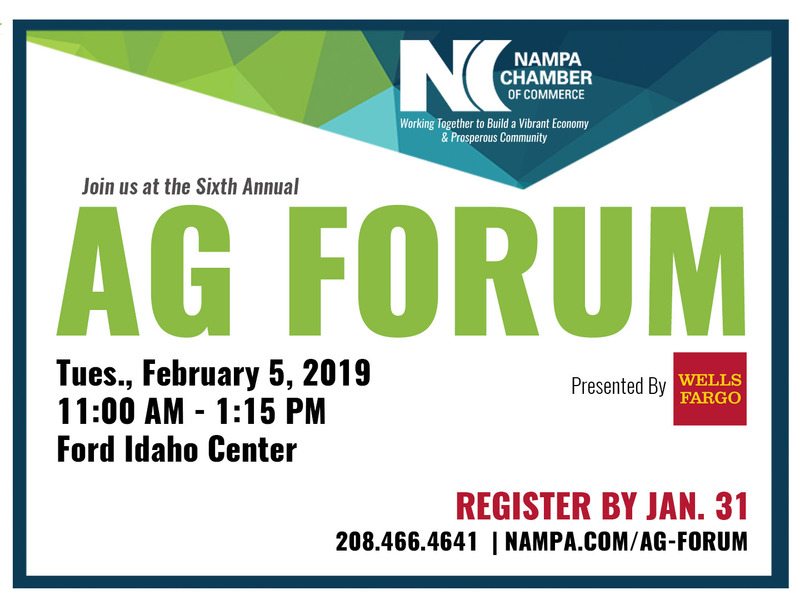 The Nampa Chamber of Commerce invites you to the Sixth Annual AG Forum on Tuesday, February 5, 2019, from 11:00am-1:15pm at the Ford Idaho Center. The AG Forum connects the agricultural industry and local businesses while raising awareness that agriculture and food processing are still the backbone of Southern Idaho's Economy. We invite you to join us in supporting the AG Forum by partnering with us as a sponsor and/or exhibitor. Are you interested in learning about the youth scholarships available? The Nampa/Caldwell Chambers of Commerce Agri-Business Committee Scholarships are available to Canyon County residents and also to continuing students who graduated from a Canyon County High School. Applicants must be a freshman, sophomore, junior, senior or graduate level student and enrolled full-time at a community college or university for the coming academic year. Major or minor in an agriculture-related field is required.